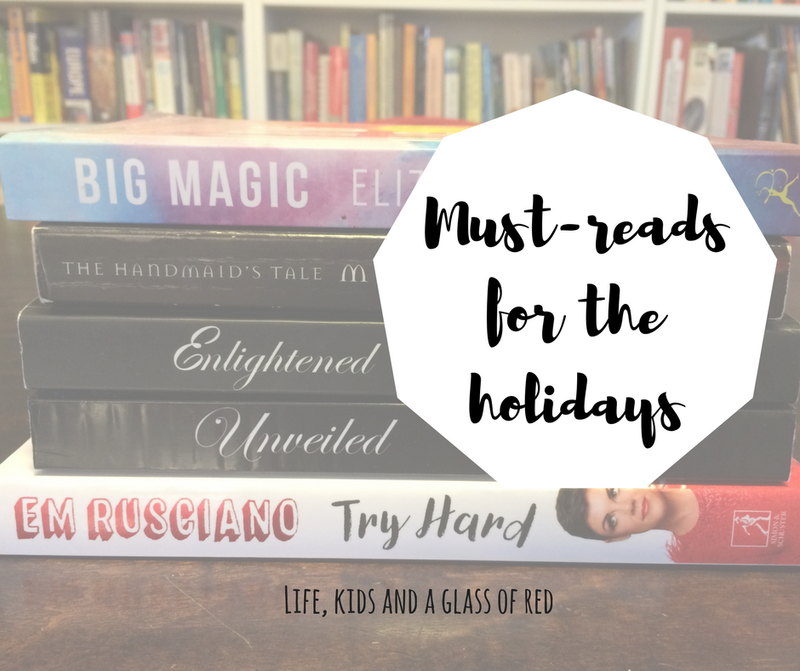 School holidays are here for most states, and with the long Easter break coming up soon, here are some fab books to pack when you go away, or perfect for relaxing at home. Em Rusciano’s Try Hard is hilarious. I love Em – I saw one of her stand-up comedy shows in Canberra last year and she had the audience in fits of laughter. This book will also have you laughing, and possibly have a few tears, as she talks about motherhood, mayhem and marriage. Such an easy read, loved it! Enlightened and Unveiled are the first in a series of paranormal romance books by new author SJ Jensar. Both of these books are so good, you’ll want to turn off the phone and keeps the kids occupied so you can keep on reading! Think Twilight, all grown up. Vampires, ancient families, secrets, romance, adventure – these books have it all. I’ve lost count of how many times I’ve read and reread these books, and they are always in my suitcase when we go away. The Handmaid’s Tale by Margaret Atwood, is one of the most incredible books I’ve ever read. I first read this in high school for our English Literature class, and it has stuck with me ever since. Set in a future where a chemical holocaust of sorts has occurred, and women are being used as walking wombs to help repopulate the higher classes, you can’t help but wonder if this book is somewhat prophetic. Offred, the central character, tells of her life as a Handmaid, expecting to conceive and carry a baby for the household she is assigned to. With everything about her identity stripped away from her, she desperately tries to remember who she once was, before it all began. The book has recently been turned into a series for Hulu, for those who are lucky enough to be able to watch it. The book can be a bit of a heavy read at times, but it is so good, you won’t regret reading it. Big Magic by Elizabeth Gilbert is one of those books that while reading it, I’ve had those “a-ha” moments. It is inspirational and will challenge you to embrace your curiosity, do what you love, and remind you that life is too short to not do what you love. I hope you enjoy reading them as much as I did! What are some of your recommendations for must-read books? ah, I forgot about the book reading adventures available for the long weekend! I’ll have to plan some in somewhere!